Body hair transplant is used when less hair are available on scalp. 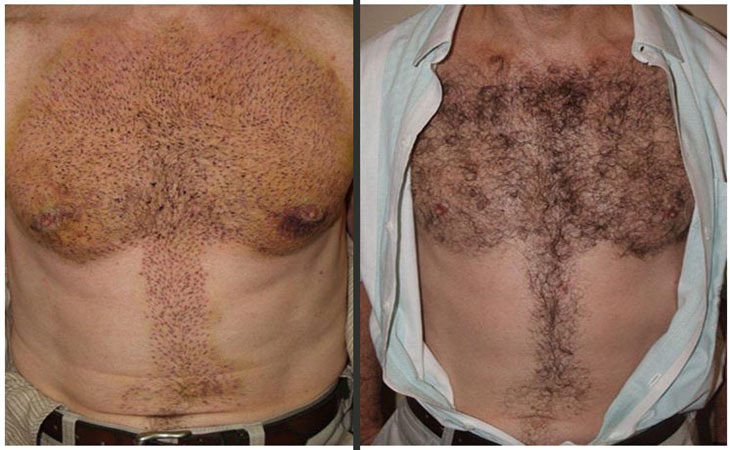 Body Hair Transplant can harvest hair from beard, chest, arm & other areas of body. One of the most important values in plastic surgery is “REPLACE LIKE WITH LIKE”. At Hair transplant Delhi, Hairs from the scalp are the best replacement for the bald areas of scalp but regrettably some patients do not have sufficient hair over the head to complete result. In such cases, it is possible to transplant body hairs which are related to head hairs in structure and quality. Hairs may be taken from the beard area, armpits, chest, abdomen, back, arms and the legs. little thousand grafts can be taken from all these areas combined varying from patient to patient. If the Patients have not enough body hair cannot undergo this procedure.